On the market for the first time in 60 years! A fabulous Lake Winnipesaukee lodge at the waters edge. Home has 2700 square feet with 5 Bedrooms (4 bedroom septic) with 2 1/4 baths. Three of the bedrooms have sinks installed. Property includes a boat house with breakwater, dock and 230' of pristine waterfront including a sheltered hard packed sugar sand beach along with a guest house and detached garage. Incredible views looking between Bear Island and Pine Island and directly into the White Mountains. With .91 acres of land you have excellent privacy with much of the natural tree cover intact. The home has many great interior details including natural wood work, numerous built ins, coffered ceilings, hardwood floors, field-stone fireplace and two screen porches. Recent improvements include a new roof, exterior paint and well. Truly the old lake feel with charm that you can't easily replicate. A very good value in today's marketplace. Listed by the Bean Group. Located in Meredith NH this home is just a short ride in from Interstate 93 off exit 23 and in less than 2 hours you can be in Boston. 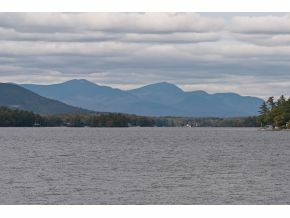 Lake Winnipesaukee is a 42,000 acre boaters paradise. In the summer you can boat to restaurants and in the winter you can be on the slopes of Loon or Waterville in less than 45 minutes. For additional information on this home call Lady of the Lake Realty at 1-888-737-5550 or e-mail at info@nhlakesrealty.com or visit our website to view similar lake homes in New Hampshire at www.nhlakesrealty.com or www.lakeorskirealestate.com. Contact us today to see if this home is still available? ?